Today on 12th Feb. 2019 Consumers Disputer Commission under Government of Punjab introduce an official Notification on “ The Tribune Newspaper” related to the Peon vacancies in the department. 8th Pass Government jobs for Peon in India under Punjab state. You can also check the Notification on the newspaper as well as we also share the completed detail below in the same job posting article. In exercise of powers conferred under section 24-B of Consumer Protection Act, 1986 interpreted by the Hon'ble Apex Court in Civil Appeal No. 2740 of 2007- "State of U.P and others versus All U.P. Consumer Protection Bar Association" read with undertaking given by the Punjab Government in COCP no. 1338 of 2000 in CWP No. 13591 of 1999- Mukand Gupta Versus State of Punajb. The President of State Commission, Punjab being the competent authority has directed to invite applications from the eligible and desirous candidates for filling up four temporary vacant posts of Peons (2 for ESM, 1 for S.C. and 1 for Physically Handicapped), in the pay band of Rs. 4900-10680- with grade pay of Rs.1650/-. During the probation period, fixed pay will be given at minimum of the pay band and no Grade Pay, annual increments or other allowances shall be given, as per the circular letter no. 7/204/2012-4.F.P.1/66 dated 15.1.15 issued by the Government of Punjab, Department of Finance. Reservation will be as per applicable rules and Punjab Government Policy Guidelines. The certificate of SC/ESM/P.W.D should be in accordance with the instructions of the concerned department of Punjab Government. Pay Band: Rs.4900 – Rs.10680 per Month. QUALIFICATION FOR THE POST OF PEON: The candidate must have passed Middle Standard Examination from a recognized Board or Institution or equivalent examination with Punjabi as a subject. 1. Preference will be given to candidates with higher qualification. 2. The selection shall be made on the basis of General Skill Test (practical), assessment of general aptitude, behaviour, dress as well as mannerism; weightage shall be given to the candidates possessing additional educational qualification i.e. 10+2, Diploma from a recognized university and Graduation etc. and to those who have experience of working in Central Government/State Government etc. AGE CRITERIA: No person shall be recruited by direct appointment, if he/she is less than 18 year or more than 37 years respectively on 01.01.2019. Provided that the upper age limit may be relaxed to the candidates belonging to the categories SC/ST/OBC/ESM etc. as per rules. 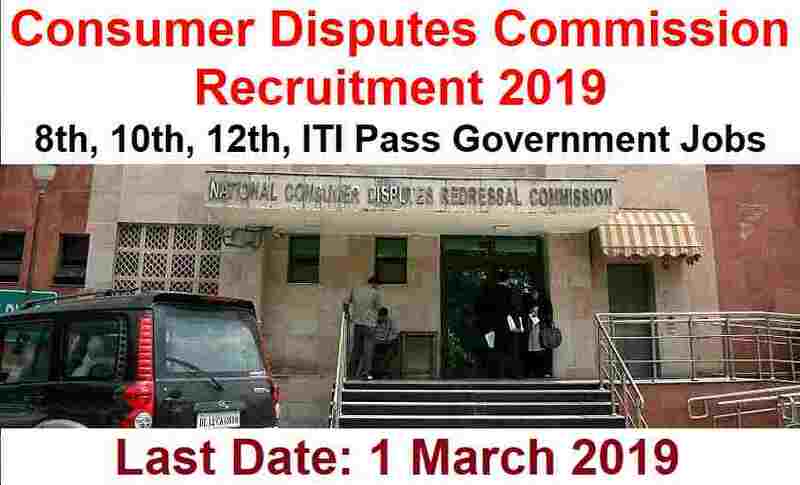 The Office of the State Consumer Disputes Redressal Commission, Punjab, Dakshin Marg, Sector 37-A, Chandigarh upto 01.03.2019. Candidate must submit attested copies of the certificates and a certificate of character from the head of the School/College/Institution last attended, if any and similar applicants from two responsible persons not being his relatives, who are well acquainted with him in his private life and are unconnected with his university, College, School or institution. Applications incomplete, unsigned or received after the closing date, will not be entertained. By order of the President, State Commission. 1ST March 2019 is the Last Date to accept applications.